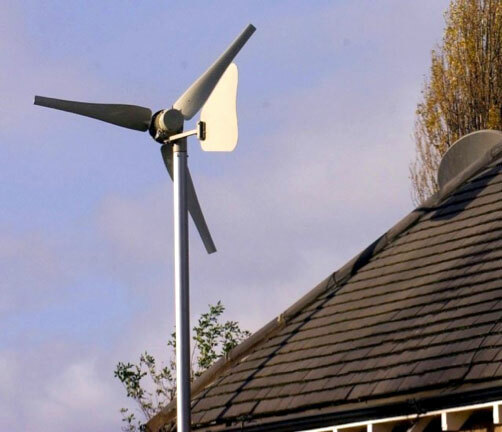 You can generate electricity at home with small-scale wind turbines. Wind turbines use large blades to harness the power of the wind. When the wind blows, the blades are forced round, driving a turbine which generates electricity. The stronger the wind, the more electricity produced. About 40% of all wind energy in Europe blows over the UK, making it an ideal country for domestic turbines (known as microwind or small-wind turbines). A typical system in an exposed site can easily generate more power than your lights and electrical appliances use. Cut your electricity bills. Wind is free, so once you’ve paid for the initial installation your electricity costs will be reduced. Get paid for what you generate: Through Feed-in Tariffs, you get paid for the electricity you generate even if you use it. What you don’t use, you can export to the local grid – and receive payment for that too. Store electricity for a calm day: If your home isn’t connected to the national grid you can store excess electricity in batteries and use it when there is no wind.